WeeCOOK make all their pie fillings themselves using produce from local or Scottish wholesalers, they hand fill, finish, crimp, score and bake all their pies themselves. They have a range of pies that vary from traditional to more exotic fillings. All fillings are made in house so they can adapt and make batches of bespoke or collaborative pie fillings as requested! Each pie is made with passion and pride and they want people who eat their pies to enjoy them as much as they do. Pies are for sale directly at the restaurant the WeeCOOK Kitchen. They have a pie of the day on the menus and pies can also be purchased to take away. 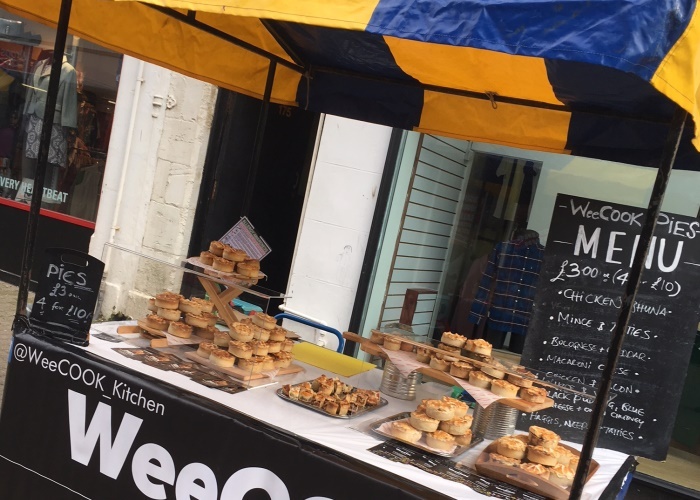 WeeCOOK regularly set up pie stalls and pie sale days at the WeeCOOK Kitchen and details are published on social media and their website. Please contact to enquire about bespoke pie orders and large numbers for special occasion or events. Pies can also be purchased at the Angus Farmers Markets, Forfar market. Pie fillings are advertised on Facebook a week prior so pies can be selected and pre ordered for collection at the market or from the WeeCOOK Kitchen restaurant. There are plans in the pipeline to order pies for delivery online so watch this space for more info!